Cape Town - Kaizer Chiefs midfielder Willard Katsande expects a 'huge' Amakhosi support base in the stands for Wednesday's match away at Chippa United. Amakhsoi are set to meet the Chilli Boys in an Absa Premiership encounter at the Nelson Mandela Bay Stadium on Wednesday evening, with kick off at 19:30. 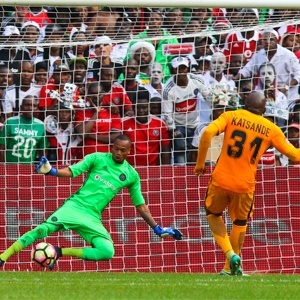 Chiefs have taken several home games to Durban this season as they enjoy a very big following in the KwaZulu-Natal region, and despite Wednesday's game against Chippa being an away one, Katsande also expects his side to have a lot of support from the stands. "Chippa is a quality team, and it's always nice to play them, because they play fantastic football," said the Zimbabwean midfielder enforcer. "Also, as Kaizer Chiefs, we draw a huge crowd in PE so I think it's going to be a good game for the fans and for us as well," the Zimbabwean midfield hard-man added on KickOff. Chiefs beat Chippa 1-0 in a Telkom Knockout game at the same venue just one month ago, but Katsande says that will count for little on Wednesday. "The bottom line is we will try to go there and collect maximum points. Whatever happened in terms of winning the cup game is now under the bridge because we are out of the cup. "Now we are going there in one mind, which is to grind the result and take maximum points," he added.